Let’s have some festive nail candy! China Glaze Love Marilyn from the Eye Candy 3-D Glitters Collection is a bonafide contender to be my Christmas Day nail polish. Does anyone else meticulously plan their Christmas Day manicures? It’s a little bit of a Christmas Eve tradition of mine to super-bling it up in honour of the big day! I’m thinking I might wear it as a french tip though over a red cream (something like Butter London Come To Bed Red). The above photo shows 3 coats for a full coverage over a bare nail. Removal is a total pig and I did get a fair bit of chipping from this one despite a top coat. But you know, it’s easier to forgive these things when it’s OMGGLITTERREDCHRISTMASPOLISH. Do you have your Christmas Day mani sorted out? Im wearing this right now, a shop near me sells lots of China Glaze and OPI. I bought quite a lot of the polishes from this collection, a lot prettier than the Muppets by OPI i think. That’s a nice glitter! This year I’ll be sporting a French manicure with either OPI Affair in Red Square or Orly Quintessential Crimson base, with OPI Happy Anniversary tips. Jingle, jingle! Wow! this is so gorgeous!! I’m a glitter fiend, and this certainly fills the bill! Oh, the colours… Look at the sparkly colours…!!! Soooo beautiful on your nails! My Christmas nail was going to be LD Caught Red Handed with a corner swipe of Chelsea Embankment by NI as I posted on my blog, but I prefer a block colour, so thinking of going for my of my shimmery red OPI shade! Gorgeous! Too bad my nails can’t rock glitter as well as yours can. Woahh, haven’t seen this one before… It’s GORGEOUS! This has to be the most Christmasy nail polish colour ever. I think this is one of the best colour/glitter paints I have ever seen. 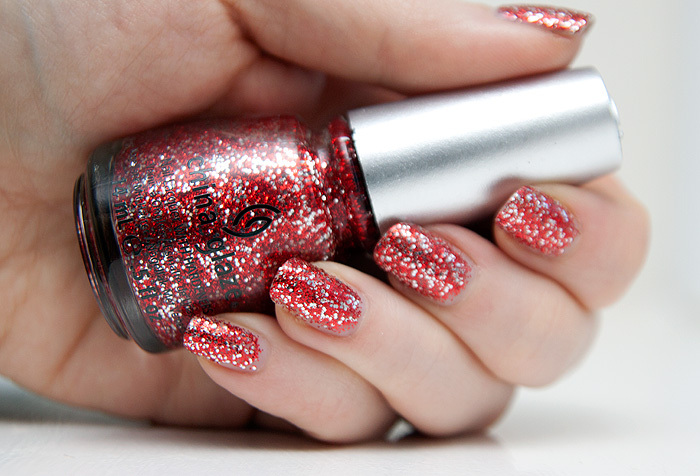 ARGH I wish I’d placed an Ebay order in time for Christmas, now I want this to be my Christmas mani!